At first look, nothing wrong, it’s attractive. Certainly it is intended to bring one’s thought to the empty tomb of Jesus Christ, and therefore to remind one of His resurrection out from the dead, by which he was declared to be the Son of God with power. 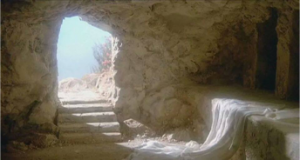 The problem with the picture is its inconsistency with the Scriptural account of Jesus empty tomb as presented to Peter and John, described in the Gospel of John. In John 19:40, we read, “Then took they the body of Jesus, and wound it in linen clothes with the spices, as the manner of the Jews is to bury. We need to inspect the phrase “wound it in linen.” We should understand the process for the burial was to take strips of linen, dip them in the mixture of myrrh and aloes customarily used for burial by the Jews, and then wind the limbs and torso of the dead. There was a cocoon shell encasing the dead body. In the case of Jesus’ burial, the compound of myrrh and aloes weighed about 100 pounds . The linen, becomes very heavy when soaked in the “spices” used for the burial. In the account of the entrance of Peter and John to the empty tomb of Jesus, the supposed picture of which is above, they saw nothing like it. John, referring to himself in third person, says in verse 8 that what he saw caused him to believe. The translation here – “linen clothes lying” – obscures what he saw. That translation probably causes the artist of the picture above to get this wrong.What the speedier of the two apostles – not necessarily younger – saw first was the grave clothes as they were. That is, he saw them in the cocoon shape, yet empty, and the soudarion (napkin) that was previously draped over the windings folded neatly in a separate place. The evidence John saw was persuasive. Jesus had passed through the shell of the grave clothes, unlike Lazarus, who came from his tomb yet bound in them, the soudarion binding his face. Unlike Lazarus – raised by Jesus – no one needed to cut him loose from the clothes or the face wrap. Here was powerful enough evidence for two of the “pillar” apostles to believe in Jesus’ bodily resurrection.